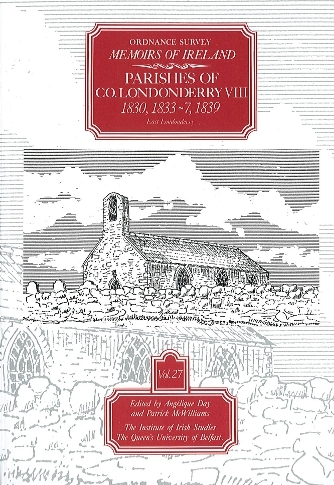 Ordnance Survey Memoirs of Ireland, Vol 27: County Londonderry VIII. This volume contains the Memoir for four parishes in east Londonderry, an area bordered on the east by the River Bann and stretching as far as the slopes of Benbradagh in the west, encompassing the towns of Garvagh and Kilrea. We learn of the economy of a region where the main sources of livelihood were farming and gishing in the waters of the Bann and Loughs Neagh and Beg. Among the people the desire for education is clear, as is shown in the excellent statistics of schools. Other topics covered include antiquities and local traditions, especially those connected with ancient monuments. Social life is also well covered through the habits of the people. This material provides a unique insight into life in this area over one hundred and fifty years ago.